How we succeeded to improve online bookings by an impressive 50% for this luxury business hotel in the heart of Kensington when we redesigned and rebuilt their website and corporate blog. Situated in the heart of London’s prestigious Kensington & Chelsea neighbourhood and part of the distinguished Worldhotels Portfolio, The London Regency Hotel is a luxury property that caters to the upper end of the business and leisure travel market. When it comes to the marketing of luxury hotels in London, there are two very considerable challenges. The first is that there are just too many luxury hotels in London. The second is that the marketing power of the Online Travel Agencies, such as Booking.com, Expedia and others, can sometimes seem overwhelming for individual hotels – even for established brands such as The London Regency. We have specialised in hotel marketing for many years and, thanks to our experience, we knew exactly what was required to help our client overcome these obstacles. Thus, we were delighted when they approached us to help them solve these two important marketing challenges and to increase more direct bookings for their hotel. The first part of our solution was to redesign and rebuild a professional custom website that was able to communicate the core brand values of The London Regency Hotel and to position it as an established and upmarket leisure and business property. In order to take full advantage of the rise of the use of mobile as a way of finding and booking hotels, it was imperative for us to create a fully responsive version of the site that would make the Client’s website accessible to users of all internet devices. Conversion rates have become a crucial success factor when competing in the tough online environment. Thefore, it was essential for us to design and build the Client’s site in such a way that it would considerably enhance the user experience and facilitate the process of finding and booking the right room as quickly and as easily as possible. To this end, we were careful to incorporate important customer-centric features, such as a simple and intuitive navigation strategy; local Google mapping; feeds for local tourist information guides; a fully integrated hotel booking engine; and a corporate blog within the new website. Moreover, we engaged our professional writing team, giving them the task of creating a fresh and compelling new copy concept for the all the pages of the new site, as well as writing relevant and engaging content for the corporate blog. As is common with most web-development projects, we invested senior consultant partner time and worked closely with the Client’s marketing manager to help our client succeed. Together, we defined the primary business and marketing objectives of the new website and created a bespoke design and build specification document. In our experience, working collaboratively and investing significant management time before commencing any design or build work notably benefits our clients. The result is a much more effective project-management process that leads to stronger websites, better SEO rankings, higher conversion rates and reduced overall costs. A crucial upgrade to the previous version of the London Regency Hotel’s website was to give them full control over it and to empower their internal marketing team by enabling them to fully edit both the copy and the images throughout the whole site. 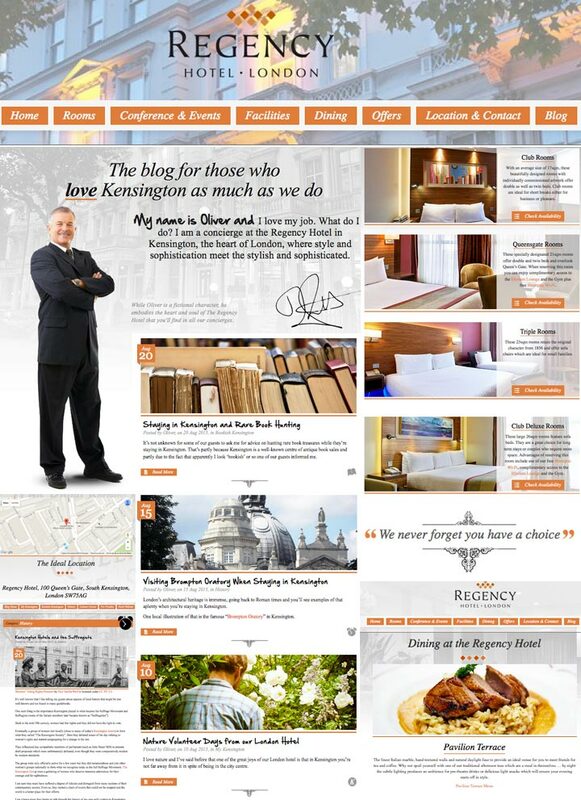 It was also important to give The London Regency Hotel full access to and control of their new corporate blog. For this reason, we decided to use WordPress for both the website and the blog. Over the years, WordPress has evolved massively in terms of functionality and features, and it is now the platform of choice for large businesses and web developers alike. In the case of our client’s website, we were keen not only to take full advantage of the advanced functionality that WordPress offers nowadays, but to help the Client benefit from the easy-to-use CMS features too. After all our careful strategising and planning, we were naturally delighted when our client reported an increase in website conversions from traffic to sales of approximately 50%! And for the London Regency Hotel, that represented a large number of extra bookings.